Advance party Chris, Martin, Kenny and I headed over to Skye on Tuesday morning with the promise of an improving picture. Martin + Chris went straight to Glenbrittle and after pitching their tents had an alpine start at 1pm for the south section of the ridge, getting the best of the weather for the day. 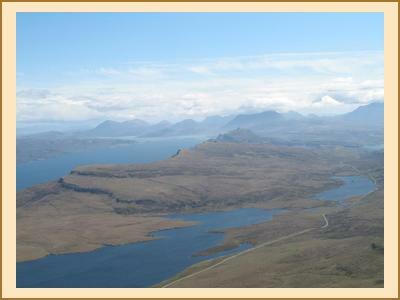 Kenny and I decided against the ridge and also enjoyed a fine day on the Storr and Hartaval. The weather had improved but down at the campsite the wind was pretty vicious and the EMC mess tent had to stay in the car. The forecast for Wednesday was supposed to be good. On that basis Chris + Martin opted for the middle three peaks on the Cuillin. Kenny and I were going to join them but the weather worsened again on the drive up and we carried onto the lower summits of MacLeod’s tables. It turned out to be a wise move. Once on the ridge, in the face of blizzards and strong winds, Martin + Chris decided that Chris’s last 3 Skye munros could wait for another day and retreated to the Carbost to dry out. It was an anti social night at the campsite as we all battened down the hatches and retreated into our tents. Fresh snow overnight, cloud on the cuillin and a bitterly cold wind meant another leisurely start. The conditions did not deter the three young ridge attempters who spent a long time packing their rucksacks before heading off at 11am. Sitting in the car with mugs of coffee, listening to woman’s hour, “Skye ridge gurus” Martin + Kenny nodded sagely to each other and summed up the situation in one word “failure”. Martin + Chris went to the Storr and Hartaval. 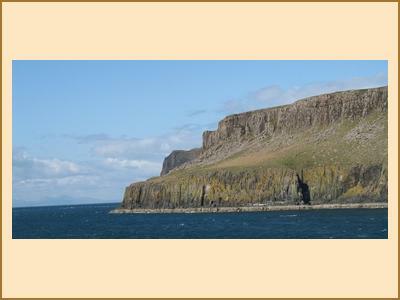 Kenny and I had another long drive, this time to Neist point, a truly magical spot. We only managed to do one route but had a good reccie of the crags and did the classic lighthouse walk with the rest of the tourists. The weather on the ridge improved considerably and all the fresh snow had gone – perhaps the young ridge attempters had judged it right. Meanwhile, the rest of the EMC was due to arrive with a few drop outs due to an unfavourable forecast for the weekend, although Nigel was still predicting high pressure. Friday night was more enjoyable at the campsite as the bitter wind had finally dropped and Nigel’s car boot provided a natural spot for socialising. It was Tim’s first time on Skye (after nearly a decade in Scotland!) and when asked what he thought he muttered something about it being quite impressive but he just needed to bag something quickly. The plan for Saturday for all 11 of us was Sgurr a Mhadaidh, Sgurr a Greadaidh and Sgurr na Bannachdich via the scramble on Sgurr Thuilm. Once again the ridge did not want to give up the munros easily. The weather got worse fairly quickly and by the time we got to Sgurr Thuilm it was even snowing lightly. We pressed on and everyone got into their stride scrambling quickly and confidently in the murk and slightly damp rock. Sgurr a Ghreadaidh was despatched and at the col before Sgurr na Banachdich, the ridge cleared with views to Loch Coruisk and Blaven. Murk returned for Banachdich when 6 of us headed down at the Bealach and discovered why the guidebook emphasises the need to keep left, left and left again. Martin, Chris, Claire, Rebecca and Tim carried onto Sgurr Dearg where Tim and Rebecca were then left gearing up at the foot of the In Pinn in the face of deterioriating conditions. At this point the young ridge attempters of the previous day were spotted and they were added to the stats for the alleged 90% failure rate on the ridge. 3 hours after the rest of us got back to the site and had showered and eaten, we were starting to get mildly concerned about Tim and Rebecca. The EMC binoculars were utilised for any movement seen on the Coire Laggan path. Just when we were about to despatch Martin to head up the path, the two of them were finally spotted. Wet and a bit bedraggled but triumphant after an epic ascent of the inaccessible pinnacle. Things were not looking so good for Sunday with a weather warning in place for the Northwest of Scotland. In particular the text message from Chris’s wife suggested that despatching to the youth hostel might be a good idea. We managed to last the night but the campsite was abandoned by the EMC between 730am and 8am for the early breakfast at the Carbost Inn where plans were hatched for Skye 2013 before the long drive home in lashing rain and gale force winds.